COMEDK UGET Second Round Counselling 2018: COMEDK that is in charge of conducting the UGET 2018 examination for engineering courses conducts online centralized single window counselling for merit-based admission. For the academic session of 2018-19, the COMEDK UGET counselling has begun from 16 July. The COMEDK Counselling procedure will involve registration, choice-filling, allotment of seats, fee payment and document verification. All the eligible candidates will have to first register themselves for UGET counselling after which the candidates will have to fill in their preferred courses and institutes for admissions. Mock allotment will be held by the admission committee to let the candidates know which seats will probably be allotted to them as per their current selected options. Changing and modification of options will be allowed after the mock allotment. The final seat allotment will be done based on the merit and preference of the candidates selected in the COMEDK UGET Counselling Process. Selected candidates will have to pay the fees online after which the verification entry card will be generated. Admissions will be confirmed after the verification of documents. Candidates can find here the COMEDK UGET 2018 Counselling Dates, Schedule, Counselling Proceddure and Seat Allotment Details. New : * COMEDK UGET 2018 Engineering Counseling has started on 16th July 2018. COMEDK Round 2 counselling will begin on 31st July 2018. Click here to check the schedule. 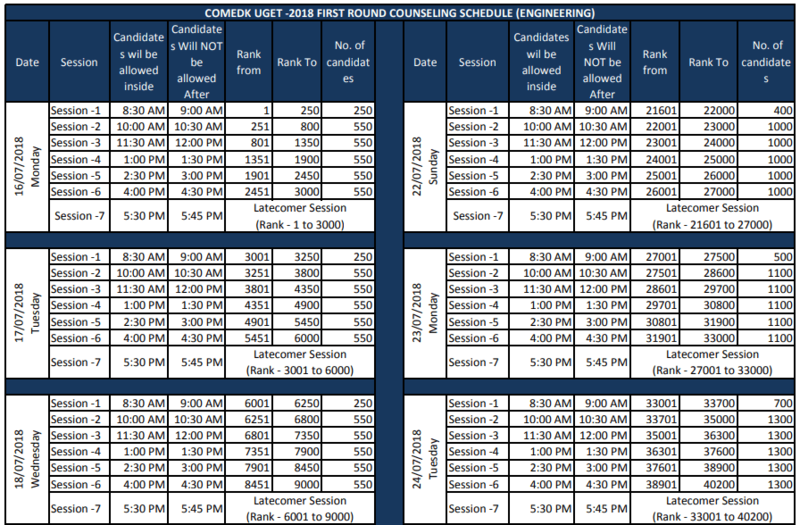 COMEDK UGET -2018 FIRST ROUND COUNSELING SCHEDULE (ENGINEERING) has started for ranks 1- 3000. Know the time and session in the Image given below. COMEDK list of Documents to be produced during counselling has been released. Check here. 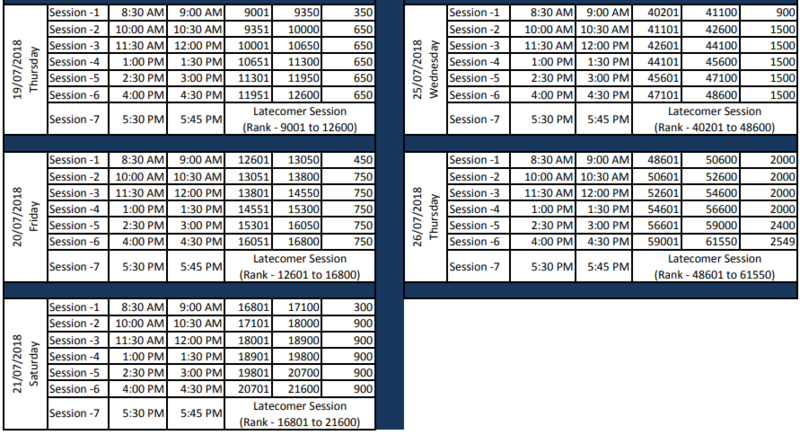 Having made available ranks of candidates on 28th May 2018 pursuant to the entrance test held on 13.05.2018 and further publishing a detailed document for seat selection process notified separately in the COMEDK website (www.comedk.org); a session wise schedule of first round counselling for Engineering courses is notified as at Annexure – A to this notification. Schedule for second round counselling will be notified later. Candidates will have to first register themselves for the COMEDK UGET counselling procedure. The link to apply will be available in the applicant login ID. Eligible candidates will have to pay the tuitions fees of Rs 5000/- before the last date. In this step, candidates will have to choose the course and college. Candidates need to enter their preferences at the time of choice filling before Round 1. After this, they have to take a print out of their selected and saved choices after confirming them. After choice filling is complete, the mock allotment will take place and the status will be uploaded to the official website of COMEDK: www.comedk.org. Candidates will have to confirm the college and the course allotted to him/her. If the candidate wants to change the option, they can do so within the specified date and time. The final allotment will be made on this basis. Seats will be allotted based on the ranks secured by the candidate. It will also depend on the availability of seats and choices filled during the COMEDK UGET counselling. Applicants who are allotted seats will be able to download their verification entry card only after payment of the fee in online mode which they have to produce at the time of document verification. Candidates who are selected will be required to report during their allotted time for document and biometric verification at Bangalore. Aspirants will receive the Original Confirmed Allotment letters only after they complete the process successfully. The document verification will be done for all the documents that candidates have to mandatorily produce during UGET counselling. This verification will be applicable only for students who have clicked on “accept” in the first round. For aspirants who had clicked on“Accept and Upgrade” in Round 1 / selected “Accept” in Round 2, the document verification and subsequent processes will be conducted after Round 2. 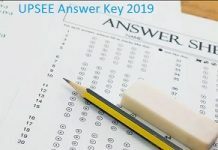 Previous articleCOMEDK UGET 2018 Answer Key, Result, Merit List and Counselling Procedure.